(a) Install the front stabilizer bar bush No. 1. 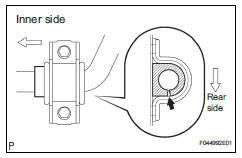 HINT: Install the bushing to the outer side of the bushing stopper on the stabilizer bar as shown in the illustration. (a) Install the front stabilizer bracket No.1 LH with the 2 bolts.